At anchor the biggest issue is power consumption. And we are self confessed power hogs. Not only does refrigeration take a lot of power, but with our tablets, computers and phones we seem to always be charging things. Especially since we are working from the boat, we need to be connected through our phones and email. The solar panels and wind generator are great - as long as there is sun and wind. But we are always monitoring the house batteries and are hyper-aware of power consumption. 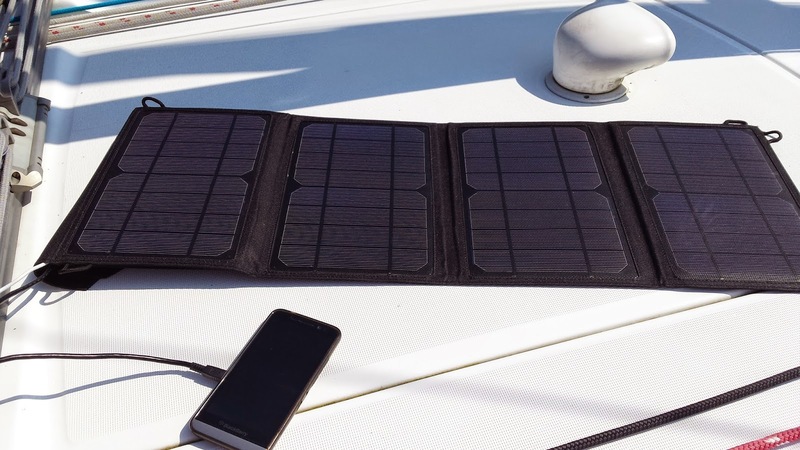 Our newest purchase is a small solar panel to power phones and tablets. It folds up for storage, weighs just over 2 lbs and you plug your phone into it with a USB cable. We bought it on Amazon for $120. So far, I have used it three times and it works really well for both Jay’s Blackberry and my Samsung. I have even used it on a day that was overcast and, although it took longer to charge, it still brought my phone and tablet up to 100% power.